Stock photo of the Old City Hall building at dusk with lights on next to another tall building against a deep blue sky, as seen from down the street which is illuminated by orange and yellow lights. 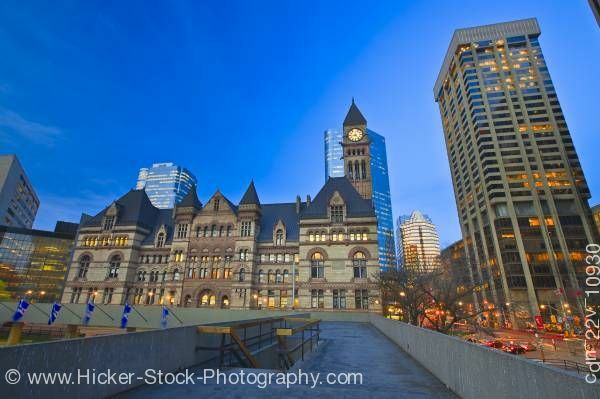 This stock photo shows the Old City Hall building seen from the Nathan Phillips Square in downtown Toronto at dusk, Ontario, Canada. A gorgeous deep blue sky is the background of this historic city building scene. Old City Hall with its rich architectural detail illuminated by its own yellow lights just before nightfall makes up the majority of this picture. Another taller, partially lit building sits to the right of Old City Hall and appears to have an orange glow.